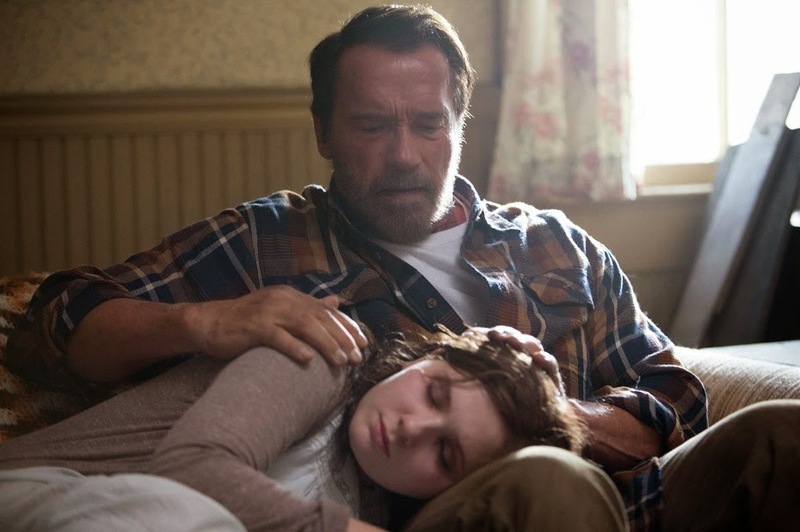 When it was first announced that Arnold Schwarzenegger would star in Maggie, a film about a father who's forced to protect his daughter as she slowly turns into a zombie, I was hardly alone in the assumption that the former Governator would spend a fair amount of screen time fighting off swarms of the undead. But now we've got our first real look at the film courtesy of the trailer below and it is surprisingly...emotional. That is not at all what I was expecting. People don't give Arnold enough credit as an actor. His post-political performances in stuff like The Last Stand and Escape Plan have been shockingly on point. Like a potent and smokey bourbon, the man has only gotten better with age, to the point where I'm getting more and more excited about the promise of the long-threatened Legend Of Conan sequel. Maggie is the feature debut of director Henry Hobson, a man who's mostly known for crafting title sequences in movies like Rango, The Lone Ranger and Snow White and the Huntsman. But this thing looks somber and moody and heart-wrenching in all the best ways. Do I want to watch Arnold shotgunning a horde of zombie faces? Of course. This is America. But I'll happily fork over my hard earned cash to watch bearded, grieving farmer Poppa Arnold care for a disintegrating Abigail Breslin anytime.